Nigeria international, John Utaka claims he has returned to the Super Eagles to fulfill the huge promise he showed when he first stepped out for Nigeria 10 years ago. The 30-year-old Utaka who scored a brace to help his French club, Montpellier win the Ligue One title, was last involved with Nigeria at the 2010 World Cup in South Africa, where he failed to get even a minute of playing time. Even then, the striker never gave up on again donning the green-white-green shirt. He said he cannot wait to lead the Eagles attack against Namibia on Sunday. 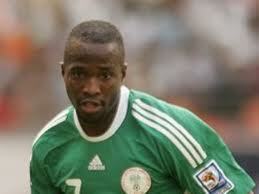 Utaka was first capped by Nigeria in 2002 and will make the final squad to the 2002 World Cup. Then, his power and skills installed him as an exciting young striker with a great future ahead of him even though it was until March 2003 that he broke his Eagles duck with a valuable winner away at Malawi in a 2004 Nations Cup qualifier. He featured for Nigeria at the 2004 and 2006 Nations Cups, where the Eagles finished third on both occasions. Utaka has been played by the national team mostly on the right side of attack even though he said he is much more comfortable leading the attack.